ECR Minerals plc (LON:ECR) the precious metals exploration and development company is pleased to confirm that exploration mapping undertaken by the Company at the Creswick Project has identified a large gold system in the Dimocks Main Shale gold targets. The DMS sits between two large gold producing areas where it is estimated historically, 15 million ounces of gold has been produced in Victoria, Australia. It is the proposition of the Company’s technical team that they have identified the hard rock source for a significant portion of the aforementioned 15 million ounces of gold production. Although further work is required to validate this proposition. The original acquisition of the Creswick project was announced by the Company on 20 April 2018 and readers may wish to review that announcement. Further information will follow to outline material developments in the now prioritised Creswick Project exploration programme. Craig Brown, Chief Executive Officer of ECR Minerals plc, commented: “We are excited by this discovery of a potentially large gold system at Creswick which has been identified by our technical team, led by Dr Rodney Boucher, and is the outcome of many years of detailed study. We are very grateful for the professionalism, experience and commitment that has been applied to reach this point. The news announced today is in line with our primary objective to make a significant and economic gold deposit discovery. The confirmation of a system which potentially feeds into two established gold producing areas is very exciting for the team; and an area of targeted future exploration. We will be providing further information in respect of this project, and specifically the drilling programme for the DMS which will be undertaken in due course when preparatory works have been undertaken. The board’s confidence in the Victoria region and its potential to hold further large gold deposits has been growing with our recent work and today’s announcement provides a significant step up in our confidence level. In the view of the Company’s technical team contemporary exploration has continually been drawn to the district due the proximity of the Ballarat and Creswick goldfields and in particular exploration programs within EL6184 have sought the source alluvial gold that was in the Berry Lead system. It is also the view of the technical team that despite numerous companies having held tenements over the area those companies failed to recognise the significance of the Dimocks Mains Shale and its potential for significant gold mineralisation. ECR Minerals’ Geologist Rodney Boucher recognised the potential of the Dimocks Main Shale and has been mapping in the region for 15 years for several companies. When a differing company relinquished the ground to the north of North Ballarat’s tenements, Rodney Boucher applied for EL6184 and provided it to ECR Minerals. Subsequently ECR Minerals have applied for EL6713 over recently relinquished ground. The Dimocks Main Shale provides an opportunity not previously recognised in Victoria. 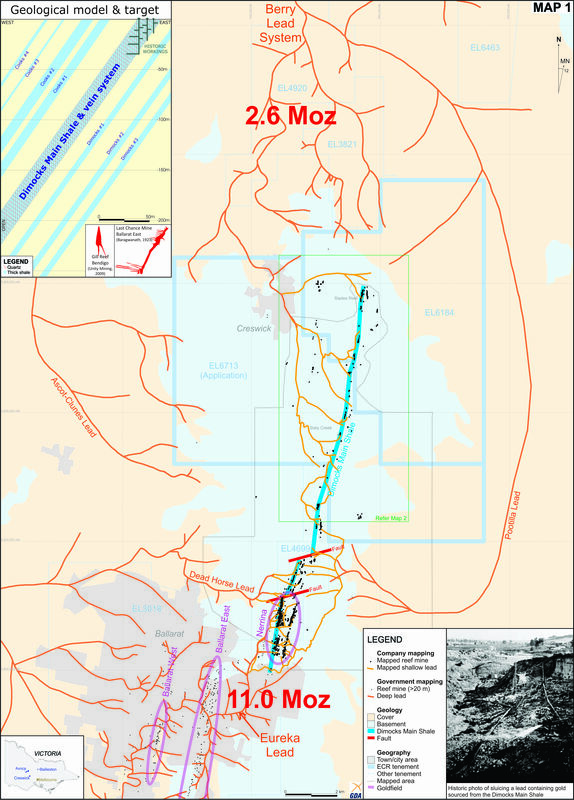 The DMS is 25m wide and hosts strata-bound auriferous quartz veins with potential for bulk mining (refer to Map 1). The shale has been mapped and shown to run for over 7 km in EL’s 6184 and 6713 (refer to Map 1). The DMS continues 8 km to the south to form one third of the Ballarat goldfield at the locality of Nerrina or Little Bendigo. Field mapping of alluvial workings (refer to Map 2) shows the potential link between the alluvial workings and their gold sources, in particular the DMS and suggests that the DMS is a major contributing source to the Berry Lead system (estimated to have produced 2.6 million ounces of gold) and a contributor to the Eureka Lead in the upper parts of the Ballarat goldfield (estimated to have produced 11 million ounces of alluvial gold plus an additional 2 million ounces of reef gold). ECR Minerals PLC’s (LON:ECR) CEO Craig Brown and geologist Dr Rodney Boucher discuss the recent work programmes carried out at the Blue Moon gold project in Australia. The directors of ECR Minerals plc announce that Christian St. John-Dennis has resigned as a director of the Company with immediate effect, in order to focus on his other business interests. The Company confirms that it expects to release assay results at its Blue Moon project tomorrow. LONDON: 29 JUNE 2018 – The directors of ECR Minerals plc are pleased to announce the Company’s unaudited half-yearly results for the six months to 31 March 2018, along with an update on the Group’s activities. Five gold exploration licences in Victoria, Australia now held by ECR’s wholly owned subsidiary Mercator Gold Australia Pty Ltd, with a sixth licence applied for. Consultancy Terra Resources identified 47 targets for potential follow-up within the Avoca, Bailieston, Moormbool and Timor exploration licences, including 15 high priority areas. Blue Moon, Bung Bong and Monte Christo gold prospects drilled, with results for Bung Bong and Monte Christo announced in June 2018. Blue Moon assay results received very recently and will be announced early next week. Acquisition of Creswick gold project, considered highly prospective for gold mineralisation. Reduced group comprehensive expense of £321,433 for 6 months ended 31 March 2018, (£432,339 for six months ended 31 March 2017). Net assets of £3,413,791 at 31 March 2018 (£2,382,561 at 31 March 2017). 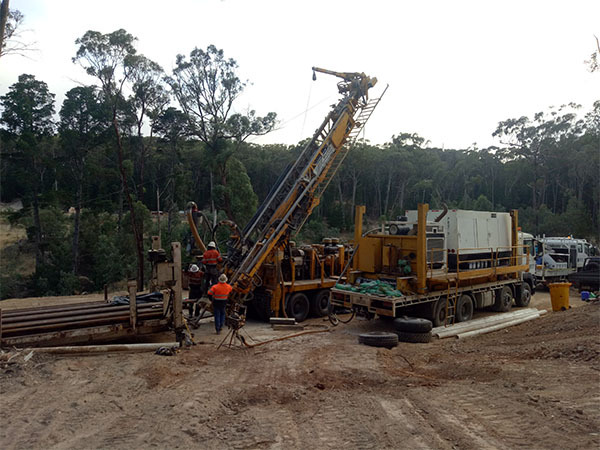 ECR has continued to concentrate its efforts on gold exploration in Victoria, Australia, although the Directors regularly review potential new projects both inside and outside Australia. We view Victoria as a relatively overlooked gold exploration destination, given its impressive past gold production of around 85 million ounces, and the presence of a number of successful modern gold mines in the state. In particular, we note that the Fosterville mine, which is located in the same district as ECR’s Bailieston and Moormbool projects, has produced more than one million ounces to date, and is now under the ownership of Canada’s Kirkland Lake Gold. Kirkland Lake’s 2018 production guidance for Fosterville is 260-300,000 ounces from high grade underground mining operations. ECR’s wholly owned Australian subsidiary Mercator Gold Australia Pty Ltd (“MGA”) now has five exploration licences in Victoria (Avoca – EL5387; Bailieston – EL5433; Creswick – EL006184, Moormbool – EL006280; and Timor – EL006278), with a sixth licence under application and expected to be granted shortly (Creswick North). In December 2017, the Company received the results of an interpretation and targeting study using open-file geophysical data covering the Avoca, Bailieston, Moormbool and Timor exploration licences. The study was carried out for MGA by the consultancy firm Terra Resources and identified a total of 47 targets for potential follow-up, including 15 high priority areas. The geophysical compilation datasets included regional airborne magnetics and radiometrics and ground gravity data, which were processed and imaged in order to perform geological interpretation and target generation. The high priority targets identified included areas already considered to be of significant interest by ECR, such as the Byron, Black Cat and Cherry Tree prospects at Bailieston, the magnetic anomaly at Moormbool, and the Leviathan trend at Timor. Several new target areas were also identified. Early in 2018, Dr Rodney Boucher, an experienced Victorian gold geologist, commenced a review of all available data on MGA’s exploration licences (at that time numbering four licences), complemented by geological mapping and geochemical surveys in selected areas. The purpose of this work was to help define targets for a diamond drilling programme extending across a number of MGA’s prospects. The geochemical surveys utilised a portable XRF to delineate proxy minerals associated with gold. 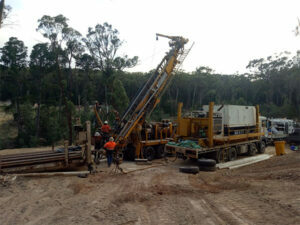 Drilling commenced at the Bung Bong prospect in April 2018, and five holes were completed. Thereafter, the rig moved to the Monte Christo prospect, and then to the Blue Moon prospect, with two holes drilled at each, after which the programme was brought to a close. The Blue Moon prospect is part of the Bailieston project area (EL5433), while Bung Bong and Monte Christo are part of the Avoca project area (EL5387). Assay results were announced in early June 2018 for the drilling at Bung Bong and Monte Christo. Results from the drilling at Blue Moon have been received very recently, and an announcement is being prepared for release early next week. All five holes at Bung Bong and the two holes at Monte Christo fulfilled their intended purpose, which was to test the structural architecture of the target areas. The holes were the first ever drilled at both Bung Bong and Monte Christo, and gold mineralisation was intersected at both prospects, although no high-grade shoots were encountered. The target at Blue Moon is a disseminated gold deposit, as opposed to the quartz reef systems at Bung Bong and Monte Christo. The drill holes at Blue Moon were designed to test arsenic and antimony anomalies identified by the soil geochemical survey completed by MGA earlier in the year. An arsenic-anomalous zone up to 40 m wide and more than 200 m long was identified, and previous work has shown anomalism over a further 150 m to the west. Previous rock chip samples include results of 12.1, 10.1 and 7.0 g/t, and previous soil surveys identified gold to 5.0 g/t (as detailed in the technical report identified in the Company’s announcement dated 20 April 2016). After the assay results from the drilling at Blue Moon have been fully interpreted, planning can begin for the next phase of exploration in Victoria. MGA acquired 100% ownership of the Creswick licence in April 2018 and applied for Creswick North shortly after. The licences are considered highly prospective for gold mineralisation hosted within the Dimocks Main Shale, which extends over a 15 km trend from the mining centre of Ballarat to the south, including approximately 3 km within the Creswick project area. In the project area, the Dimocks Main Shale (DMS) is an approximately 25 m wide shale containing bedding- and cleavage-parallel auriferous quartz veins with potential for bulk mining. Only two holes have been drilled to test the DMS within the Creswick licence, both in the 1990s. The results of this drilling included an intercept of 2 m at 12.28 g/t gold. The best previous drill intercept into the DMS to the south of Creswick is 2 m at 176 g/t gold. ECR has not yet commenced field activities at Creswick. ECR continues to have 100% ownership of the SLM gold project in La Rioja, Argentina, and is entitled to a 25% interest in the Danglay gold project in the northern Philippines. The status of both projects remains as disclosed in the Company’s annual report and accounts published in 2018. For the six months ended 31 March 2018 the financial statements of the Company as consolidated with its subsidiaries (the “Group”) record a total comprehensive expense of £321,433, the largest component of which is other administrative expenses of £240,719, which relate primarily to the development of the Company’s projects, but which cannot be capitalised under applicable accounting standards. The Group reported a total comprehensive expense of £432,339 for the six months ended 31 March 2017. The Group’s net assets were £3,413,791 at 31 March 2018 compared with £2,382,561 at 31 March 2017. ECR is a mineral exploration and development company. ECR’s wholly owned Australian subsidiary Mercator Gold Australia has 100% ownership of the Avoca, Bailieston and Timor gold projects in Victoria, Australia. The condensed consolidated half-yearly financial statements incorporate the financial statements of the Company and its subsidiaries (the “Group”) made up to 31 March 2018. The results of the subsidiaries are consolidated from the date of acquisition, being the date on which the Company obtains control, and continues to be consolidated until the date such control ceases. These condensed half-yearly consolidated financial statements do not include all of the information required for full annual financial statements, and should be read in conjunction with the consolidated financial statements of the Group for the year ended 30 September 2017. They have been prepared in accordance with the accounting policies adopted in the last annual financial statements for the year to 30 September 2017. The report of the auditors on those accounts was unqualified and did not contain a statement under section 498(2) or (3) of the Companies Act 2006, but did include a reference to matters which the auditors drew attention to by way of emphasis without qualifying their report. The financial information in this statement does not constitute full statutory accounts within the meaning of Section 434 of the Companies Act 2006. The financial information for the six months ended 31 March 2018 and 31 March 2017 is unaudited. The comparative figures for the year ended 30 September 2017 were derived from the Group’s audited financial statements for that year as filed with the Registrar of Companies. They do not constitute the financial statements for that year. During the period, no new shares or options were issued. On 20 April 2018 the Company announced that the Company’s wholly owned subsidiary Mercator Gold Australia Pty Ltd (“MGA”) has acquired 100% ownership of the Creswick gold project in central Victoria, Australia with no consideration payable by ECR or MGA. On 3 May 2018 the Company announced that drilling has been completed at the Bung Bong gold prospect and drilling activities will commence shortly at the Monte Christo prospect. On 22 May 2018 the Company announced that the Monte Christo drilling had been successfully completed and drilling commenced at the Blue Moon gold-antimony target. On 5 June 2018 the Company announced the results of diamond drilling at the Bung Bong and Monte Christo gold prospects in Central Victoria, Australia.